Will Social Media Courses Enable a Cultural Shift in Higher Education? Universities are using social media through their institutional marketing departments to attract new students and communicate with alumni. Various academic departments have reluctantly added social media courses. Some progressive universities are even hiring new full-time faculty to teach these courses. To all of this I say congratulations—but has the higher education culture shifted? This is a bigger question than should we offer a social media course or who is qualified to teach it or what college or department should be responsible for teaching social networking. A cultural shift in higher education is needed, but a social media course is not the answer. 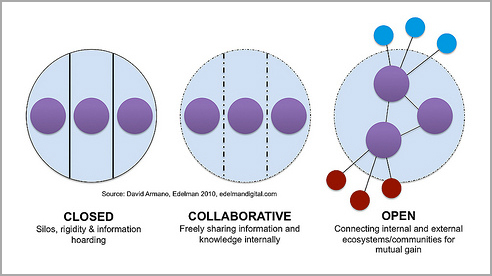 David Armano, Senior Vice President at Edelman Digital writes about three social business models: “closed,” “collaborative,” and “open.” Closed organizations are recognized by silos, rigidity, and information hoarding, while collaborative organizations freely share information and knowledge internally. Open organizations connect internal and external communities for mutual gain. So, how do you tell if a university is closed, collaborative, or open? 1. Are university presidents and administrators personally using social networking or blogging to engage with faculty, staff, and external publics? 2. Are all faculty members creating content using social media, blogs, or collaborative digital tools like Google to communicate and share with their colleagues and industry for research and learning? 3. Are all faculty members using social media to communicate and learn with their students for all of their classes? 4. Are students using social media for learning, communicating, creating, and sharing in all of their courses or just in their social media courses? 5. Are universities (and accreditation systems) measuring social media and digital output and the new ways of sharing and publishing beyond traditional academic journals for tenure? Unfortunately, most universities talk about collaboration and being open but have rigid academic silos that make real collaboration challenging. Social media courses and initiatives being added as part of existing academic silos are not enough to create the change needed in higher education for truly open cultures. To become an open organization, university presidents, administrators, and faculty must model the behavior they seek to create for higher education. Assigning student interns or individuals in a department to be responsible for social media is not the answer. Everyone in the organization must be actively engaged. You are what you measure. Universities (and accreditation systems) must measure and reward individual social media and digital output to empower change. If academic journal publication is used as the sole research measure for tenure, then social media will not be integrated to create an open organization. Social media is a powerful tool for research, learning, communicating, collaborating, and creating, but the real power is in the cultural shift to a dynamic and open organization. Posted in Blogs, Collaboration, Culture, Google, Higher Education, Research, Social Media Courses, Universities, William Ward | Comments Off on Will Social Media Courses Enable a Cultural Shift in Higher Education? You are currently browsing the archives for the William Ward category.